Today's card is about friendship and this image is from the New From My Heart stamp set. 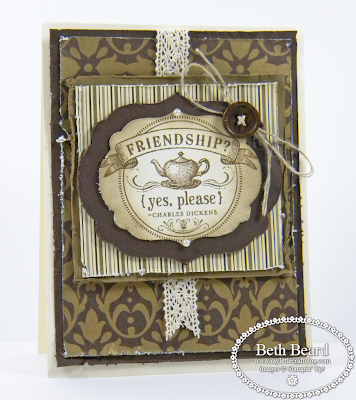 I kept staring at this stamp set and the New Naturals Designer (wood-like) Buttons and thought vintage would be the way to go. I stamped the image in Soft Suede onto Very Vanilla card stock and cut it out using the Labels Collection Framelits and the Big Shot and matted it on a larger piece of Early Espresso card stock, that was also cut using the Labels Collection Framelits, distressed the edges and sponged with Crumb Cake classic ink. The designer series paper is from Mocha Morning Specialty, which is now retired ; ( I also added some 5/8" Crochet Trim and finished with a couple Pearl Basic Jewels. Very pretty! 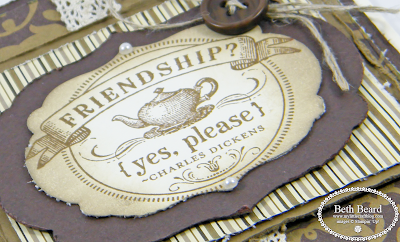 The lace is so perfect with a Dickens quote! Grrr... I am going to have to stop following your blog because you are making me want stuff that I had "overlooked" in the catalog and now I want it! :)LOL. I put my wish list together and it was over $800 before all the stuff I discovered I "must have" after seeing all the wonderful cards you created. You are so talented and I am happy to have discovered you, even if my pocketbook isn't happy about it. Thank you for taking the time to share your works of art. Beautiful....love the stamp set and the papers are perfect!! !